Miramar Beach Archives - B-Boy Productions, Inc.
August 5, 2014	by B-Boy Productions, Inc. Always check with the owner of the house to make sure you can have a wedding/private event function there and be sure your rental contract has verbiage stating this. Don’t go just by what the website says. More times than note, the website is not up-to-date and it may come back to bite you later. The city/county noise ordinance should always be considered. The area has a strict curfew outside (usually 10PM). So if you’re planning on having the reception outside, this is definitely something to take note of. This picture above is of the back deck. As you can see, it is very spacious. 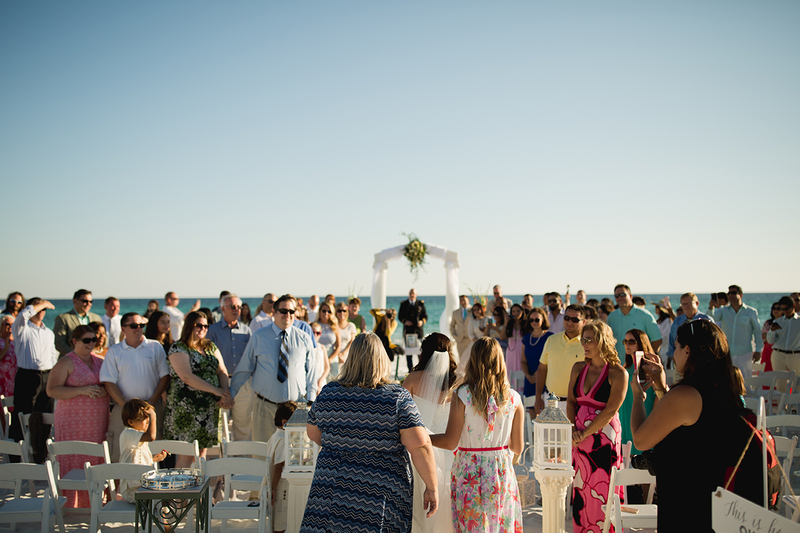 This is one of the few that lead right out to a private beach where you can have your ceremony. You can easily add a tent to the deck if you need it in case rain becomes an issue. 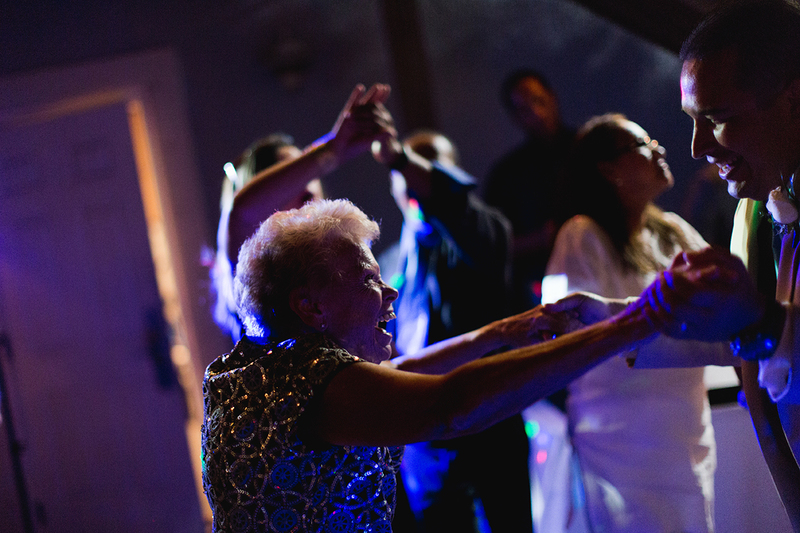 We’ve done mostly 30-40 person weddings at this location. The house is massive at 6000 square feet! 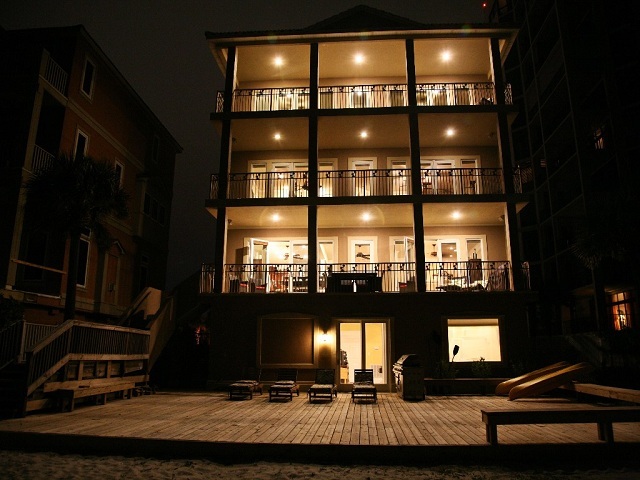 It has 4 floors, 7 bedrooms, 8.5 baths and sleeps 24-25 people. This is a perfect house for a small wedding. This three-story house has a 4th story observation deck with 360 degree views. The house sleeps 24. Comfortably, you can entertain up to 40 guests in the private backyard. The public beach is a short walk where most of the ceremonies occur. We usually set-up on the porch of the backyard close to power and most of our clients who use this house typically hire a caterer who does a buffet style set-up. 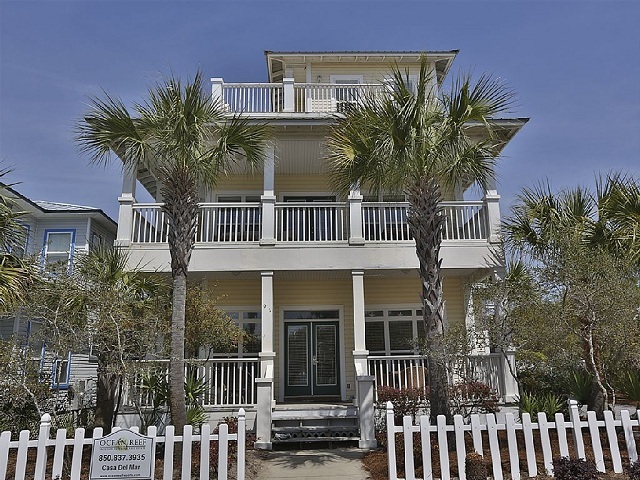 This is a community of homes that are available and close to public beach access. If you have between 25-35 people, these homes are ideal. One of the ones we tend to work at quite often is the Santorini House. It has 8 bedrooms and sleeps 24 people. If you go to their website, you’ll find a ton of different options that can fit exactly what you’re looking for. 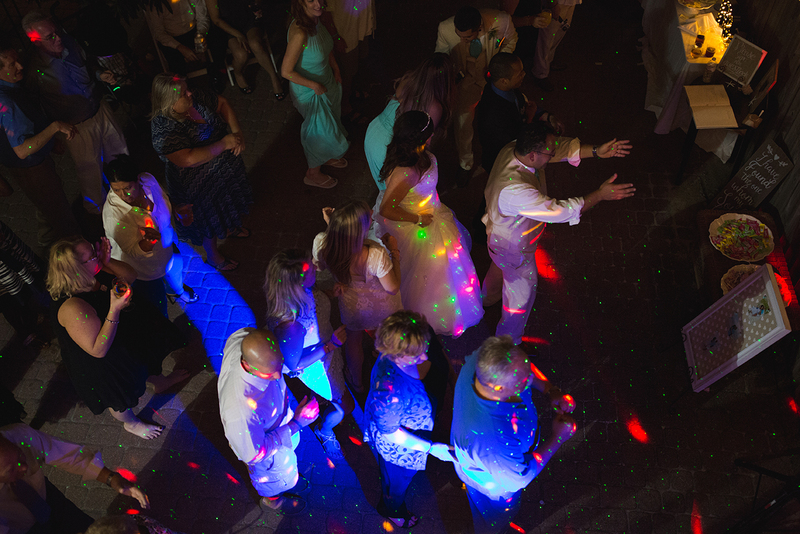 At most of these, we DJ the party outside in the private backyard or sometimes in the front yard that has a white picket fence to make it feel more private. This home is unique because it has a very large back deck where you can have a more casual reception, provided the weather doesn’t have rain in the forecast. Should rain be a possibility, the living room space can make for a great back-up plan as it’s quite large and it is easy to move furniture around. This house is perfect for entertaining 30 or so guests. 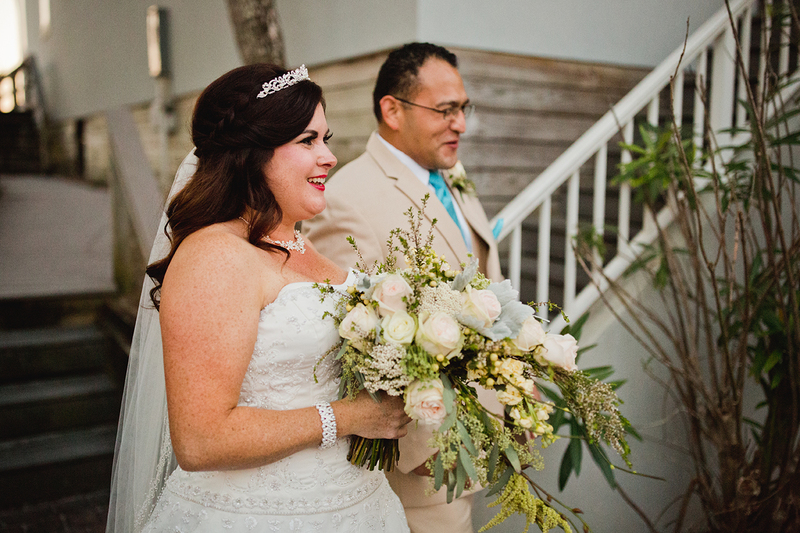 Right down the steps from the deck, you can have your ceremony on your own semi-private beach. The house itself sleeps 18. 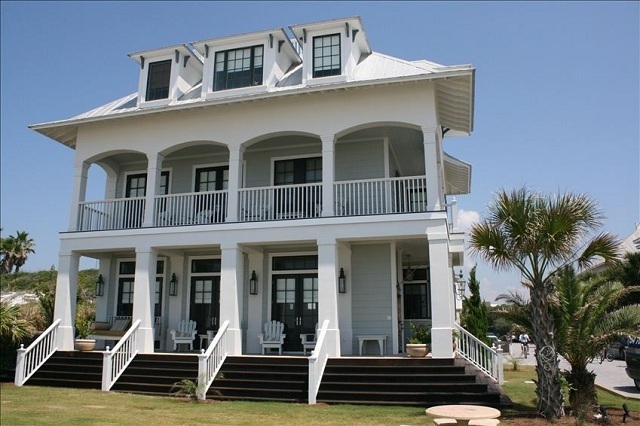 This 3 story home is one of our faves. You’re a 60 second walk from the beach. The architecture and amenities will blow away your guests. We’ve DJ’d on the deck and inside this home. It sleep 15 and would entertain 30-40 people easily. This is another home that we’ve worked at quite frequently. Santa Rosa Beach is away from the heavy traffic so a lot of people gravitate towards this area. This particular house is actually inside of a gated community which makes the event feel even more private and is just a short walk to the beach. The house also has a spacious backyard with a pool (you can do so many cool things decor-wise with a pool – lighting, candles, etc.). We typically set-up back there when DJ’ing events. 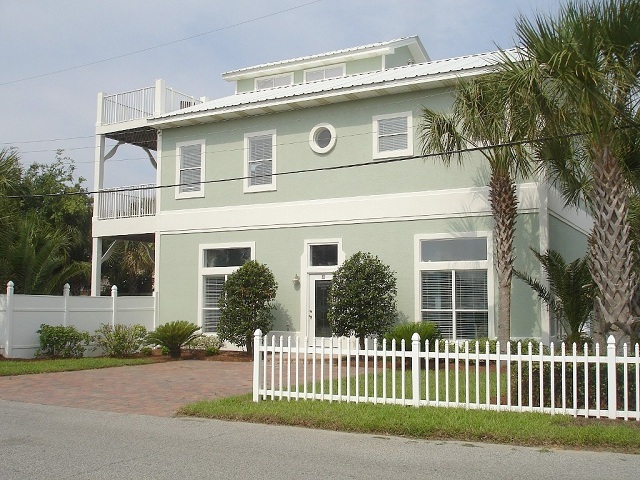 The 3 story house itself is spacious as it sleeps 16. 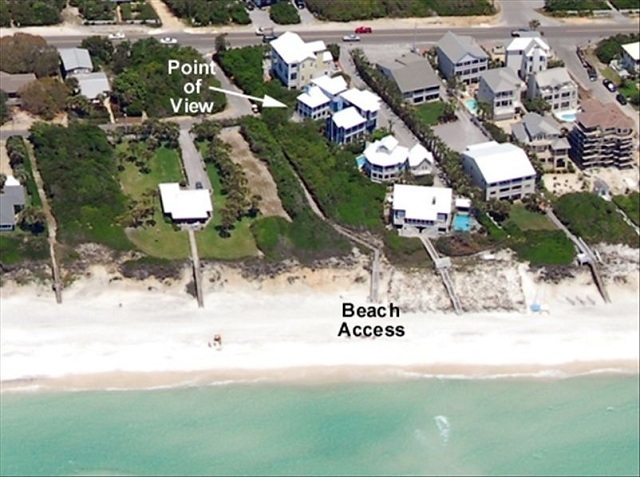 This house shares beach access with a few other neighboring homes as shown in the picture. 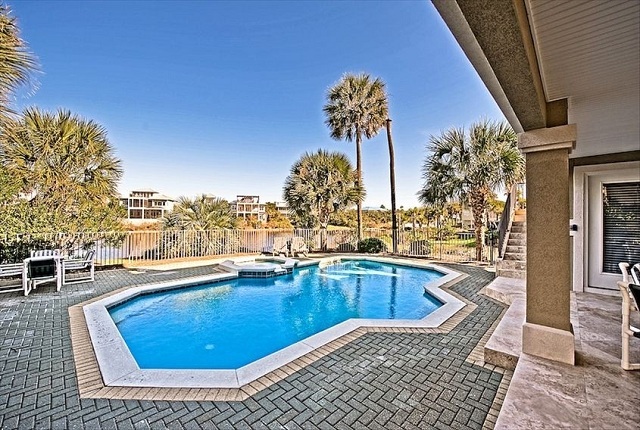 However, it boasts a nice private back deck (with a pool) for entertaining small crowds of 30-40 people. It sleeps 12. Additionally, it’s close to a few restaurants (723 Whiskey Bravo is a good one) which would be perfect for a rehearsal dinner. So there you have it! 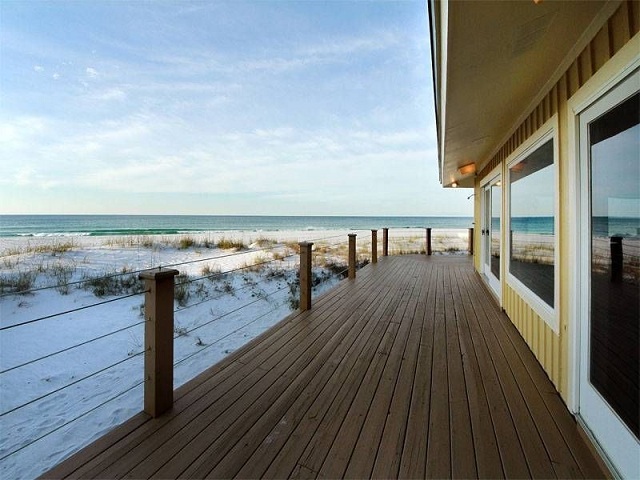 We have other beach house recommendations we can give you but for this blog focus, we’ll leave you with these. Like we’ve mentioned in the post, we’ve worked with each of these properties and know your guests would thoroughly enjoy any one of these!